Picture from Simplyrecipes.com, Recipe is my own! Put the lamb into a plastic bag large enough to fit it plus about 1/5 of the bottle of wine. Pour in enough wine to cover the meat after squeezing the air out of the bag, leaving the rest of the wine to drink with dinner. Put in the refrigerator for at least an hour, but preferably overnight. If you are using charcoal, go ahead and load the charcoal chimney and fire it up. It will take about 20 minutes until the fire is to the top of the chimney. When you are ready to grill, pull the lamb out onto a flat surface. Dry the lamb with a paper towel. Pour the oil over the lamb, with your fingers push the oil into crevices. Make sure it is all covered. Slice about 6 1-inch slits into the lamb, 3 to a side. Stuff the sliced garlic into these slits. Place the rosemary, chopped garlic, salt and pepper into a pile. Use a chef’s knife to chop and mix these ingredients together. Take the pile of spices and rub them all over the lamb. If using a charcoal grill, pour the charcoal out of the chimney into the grill and over to one side, so you create a direct heat side for searing and a indirect heat side for baking. Wait another 5-10 minutes to let the fire settle. 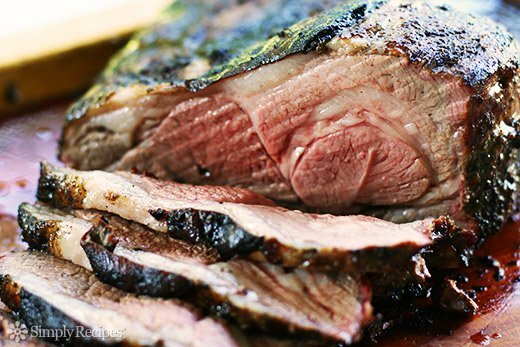 Place the lamb onto the direct heat side of the grill and close the lid with the vents open. Cook the lamb on the fire side of the grill for about 5 minutes per side, until you get a good sear all over the meat. It’s good to have two sets of tongs for meat manipulation. After searing the meat, move it to the indirect heat side of the grill and put the cover back on the grill. Let the meat cook for another 25 minutes and then start checking the temperature every 8 minutes, until the thermometer registers about 135 degrees at the thickest point. Take the meat off the grill and place on a dish and cover the meat and let it rest for 5-10 minutes. Slice the lamb across the grain, into 1/4-1/2 inch slices and place on a platter around a bowl of Republic of Jam’s Rhubarb Rosemary Chutney.